It was a chilly night. -6ºC / 21ºF. It doesn’t sound like much, but standing out in the cold, you feel the chill quickly. But it was the first clear night in 2 weeks, and the 3rd in over a month. I was really looking forward to photographing my latest target – The Horsehead Nebula. I’d tried the Horsehead 10 days back when I was giving my new SkyTracker it’s test drive from a semi-dark site just out of town. That night, I got fantastic views of the Pleiades and the Orion Nebula. 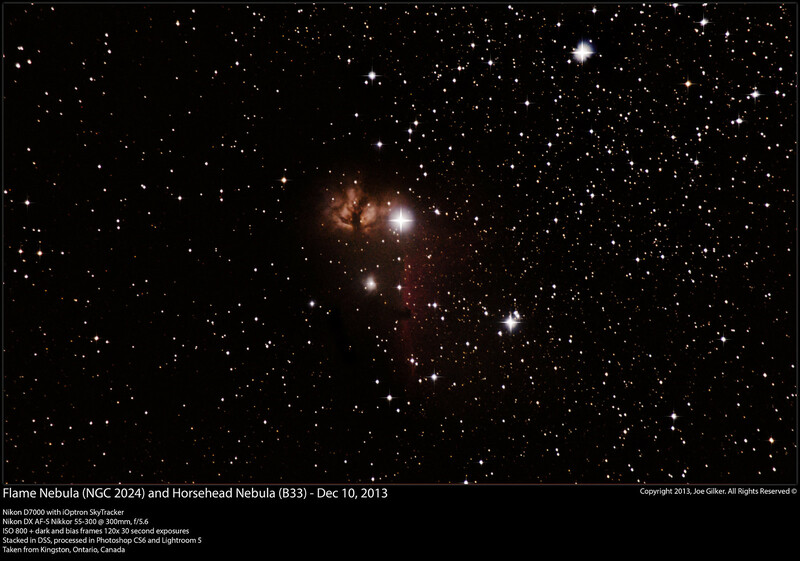 I’d left the Flame and Horsehead nebulae as my last targets for the evening. The first 2 targets went great. Alas, after I after a few shots, I stepped out of my warm car to check out my on my focus and alighnment. All was great. But apparently, I must have bumped my tripod out of alignment. When I checked again about 40 shots later, all I found in my subs were bad star trails. So in all, I only managed to get 13 useable subs. What I did get wasn’t too bad. I managed to get a semi decent view of the Flame Nebula. But my real target, the elusive Horsehead was just a faint spot in the image – barely visible to the trained eye, and invisible to anyone who doesn’t know where to look for it. So last night, it was time to get cracking and try to capture this target. I knew I wouldn’t get much with 30 second exposures (which I’m still limited to at the moment as I wait for my remote shutter control / timer to arrive). But with enough subs, I was pretty sure that I could capture it at least enough to make it visible. Neither the day or the forecast had looked very promising, but I took a peek outside at about 10PM, and sure enough, the sky was clear with only the occasional thin cloud blowing through. The moon was in the western sky, so that was definitely playing against me. And of course, I was in the city photographing from my driveway. It certainly wasn’t perfect, but it was the best sky I’d seen in weeks, so I had to take advantage of it. 100 minutes, 120 subs, 30 darks and 30 bias frames later, I packed up my gear and headed back inside. I unloaded the contents of my camera onto my computer, loaded it all up into DeepSkyStacker and went to bed due to having work in the morning. I quickly checked in on my stacked image first thing in the morning. I opened it in Photoshop, did a bit of quick and dirty stretching just to see what I had captured, and sure enough, the Horsehead was visible. Perfect! Coming home for lunch, I processed it properly. The result is what you see below. 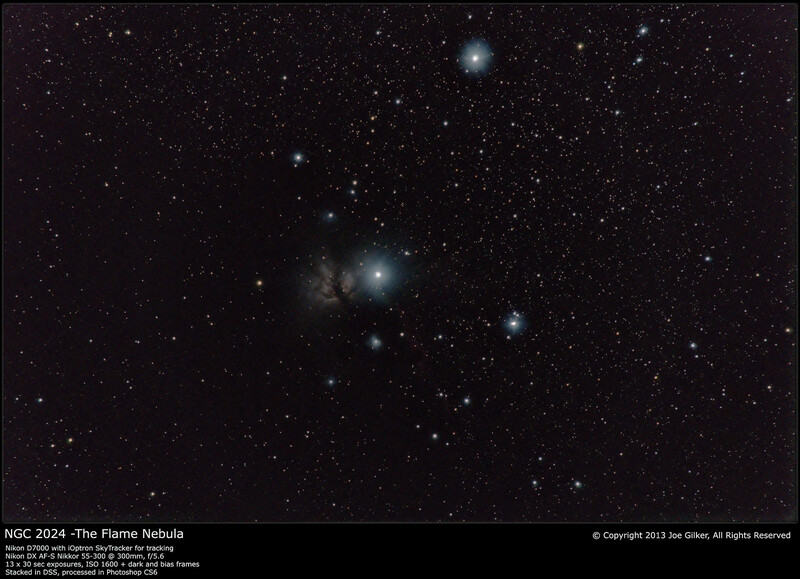 The Horsehead is clearly visible. It’s faint and not very detailed, but considering the sky conditions and the fact it was taken with nothing but a camera, I’m pretty pleased with the final result. I’m looking forward to shooting this again over the coming weeks as it rises earlier in the evening. I’ll be able to take longer exposures and hopefully get even more detail out of this beautiful nebula. But for now, I’m pleased. And here is the result of last night’s outing. Still doesn’t top the previous pic of M42 I took, but considering this is a difficult object to capture properly, I’m very happy.